With a mix of independent stores and household names, Bristol’s Park Street is one of the biggest attractors in the city to shoppers and tourists. The newest addition is Ace & Tate, the eye-wear retailer founded in Amsterdam, that enjoys a large online following. This retail concept feels very different to other eye-wear stores. Each of the physical stores has a different aesthetic, taking inspiration from the individual location. 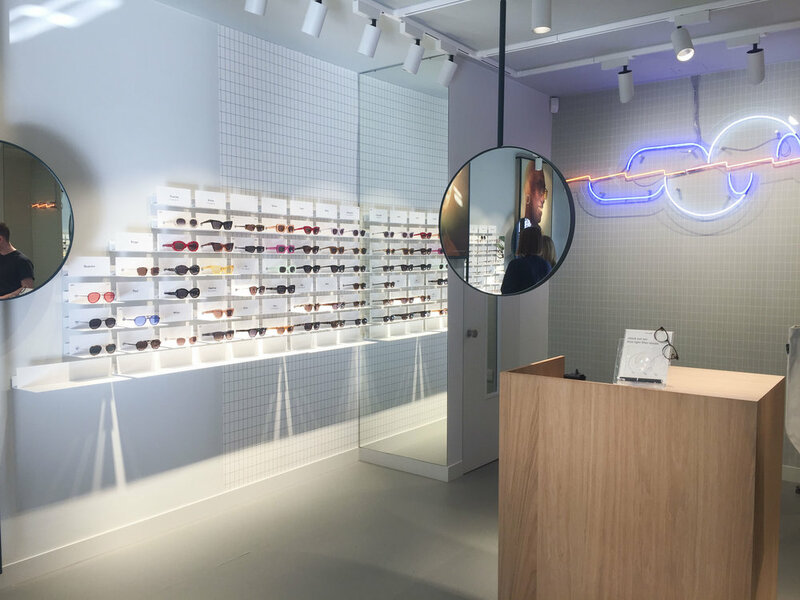 In the Bristol store designed by Weiss-heiten, a collection of hanging circular mirrors encourage customers to try on the glasses. This feature makes the space feel incredibly light and acts as a playful device to divide the space. Glasses are cleanly displayed in categories on the white perimeter walls of the space, with mirrors adjacent to each display – enhancing the generous range of products. The light, white space is punctuated with a subtle green frame system that encases the hanging mirrors and brand imagery on the walls. The powder coated frame aesthetic translates from wall and ceiling, to floor space, with lightweight red plinths that add a secondary colour to the limited palette. A flexible window display area features seat pads where customers can enjoy a range of editorials that attract the target audience.